Thomas John Watson Jr. (1914–1993) joined IBM as a salesman in 1937. His father, Thomas John Watson Sr., was CEO of the company since 1924. During WW II Watson Jr. became a pilot in the U.S. Air Force flying to Russia and the Pacific. In the army he achieved the rank of Lieutenant Colonel. After the war, Watson Jr. was promoted Vice President of IBM in 1946. So far, the company was succesful with its electromechanical tabulators, calculators and accounting machines. IBM was pioneering with electromechanical one of a kind computers and with its first electronic calculators that were vacuum-tube based. When the Korean War broke out in June 1950, the U.S. Government told Watson Jr. they wanted large scientific computers for use in aircraft design, nuclear development and military manufacturing. Watson recognized the importance of digital electronics in information processing. Only a few months after he was elected President of the company, he informed IBM's shareholders on April 29 1952 that the company was developing the Defense Calculator. One year later, the company presented the machine to the public as the IBM 701 Electronic Data Processing Machine. The 701 became the company's first large-scale electronic computer manufactured in quantity. 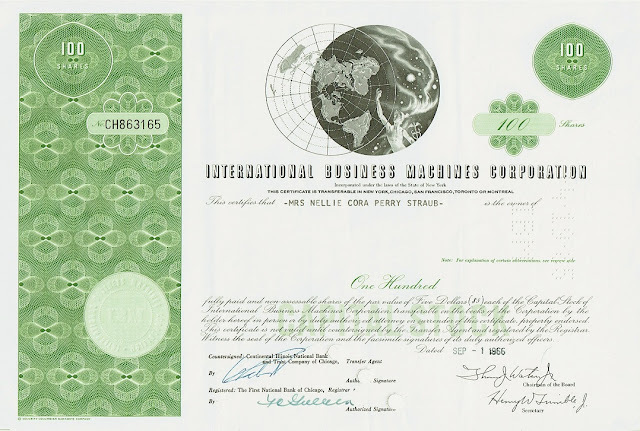 The certificate bears Thomas John Watson Jr.'s facsimile signature as President of the company, see lower right corner. It is Watson's first signature version seen on IBM stocks, with both first and middle name represented by their initials. Soon IBM stocks will show a signature with his first name fully written. In 1956 Thomas John Watson Jr. succeeded his father as Chief Executive Officer. At that time IBM employed 72,500 people and had a gross income of almost $900 million. He was elected Chairman of the Board in May 1961. So far computers were designed either for business or for scientific purposes, not both. Customers could not upgrade their systems to a bigger one without having their software completely rewritten. Also, each product line required its own sales and support team: frustrating circumstances for customers. IBM set up the SPREAD task force to deal with this situation. SPREAD, an abbreviation for Systems Programming, Research, Engineering, And Development, proposed the visionary idea that all future IBM computers should run the same programs and use the same peripheral equipment (tapes, disks, printers). Existing customers would be forced to upgrade all their equipment. Watson not only gave the risky proposal the go-ahead but also approved over $5 billion over the following years for developing the new system. System/360, introduced in 1964, became instantly a huge success being used at universities, banks, airlines and government organizations. Several System/360s made NASA's Apollo 11 mission possible and processed the data transmitted by the spacecraft's onboard computer. 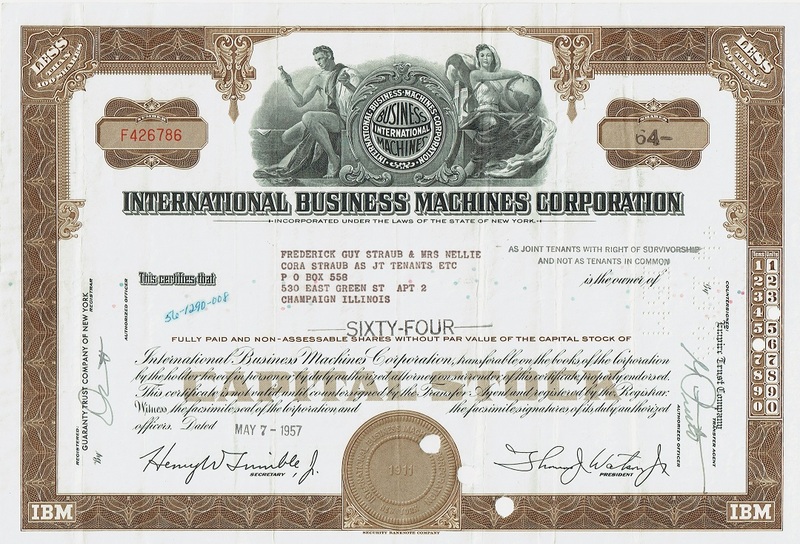 It is Watson's second signature version seen on IBM stocks, with the first name fully written. Notice the appearance of two different versions of the IBM logo. The logo on top was introduced shortly after Watson's father, Thomas J. Watson Sr., became CEO in 1924. It includes the words "Business Machines" resembling a globe and girdled by the word "International." A simple 'IBM' three-letter logo was introduced in 1947 marking the company's transition to electronic computers. Watson Jr became CEO in 1956. The logo changed again, in a subtle way communicating that "changes would come in an overall continuity". The 'IBM' letters looked now more solid and balanced, see both lower corners. Thomas Watson Jr. received in 1964 from President Lyndon B. Johnson the Medal of Freedom. The medal is awarded for exceptionally praiseworthy contribution to (1) the security or national interests of the United States, or (2) world peace, or (3) cultural or other significant public or private endeavors. In 1971 Thomas John Watson Jr. left the company for health reasons. By then IBM counted over 270,000 employees and realized a gross revenue over $8 billion. He remained a member of IBM's board of directors until 1984, with a timeout from 1979 to 1981. The General Advisory Committee (GAC) on Arms Control and Disarmement was set up by President Kennedy to give advice to the President about America's nuclear defense policy. Under Jimmy Carter, Watson Jr. was GAC's Chairman in 1978 and 1979. Subsequently, President Carter asked him to serve as U.S. Ambassador to the Soviet Union from Oct 1979 to Jan 1981. When Soviet troops moved into Afghanistan, Carter summoned Watson back to the United States in January 1980. The share still has an IBM logo, however it is not visibly printed but embossed in the light green circle. Vignettes, literally little works of printed art, depict all kinds of portraits, scenes and still lifes. They are used as an important anti-counterfeiting feature in security printing. 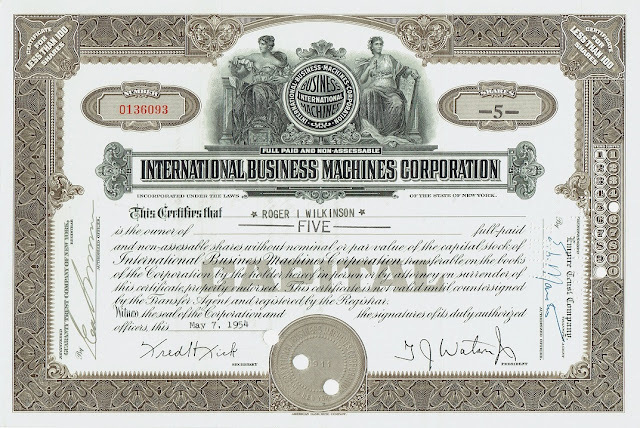 This detail from the previous stock certificate is scanned at 1200 dots per inch. 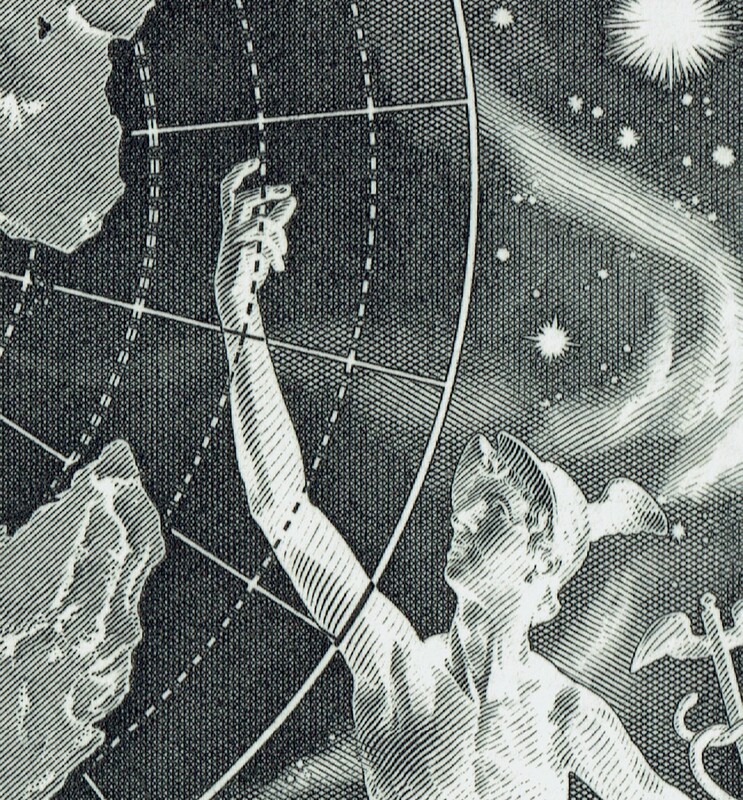 It shows Mercury, the Roman god of trade and commerce, travelling in space and looking at the map of the world. Notice how patterns of dots and lines create an optical illusion of form, shades an depth. Mercury's wrist measures only two millimeters.